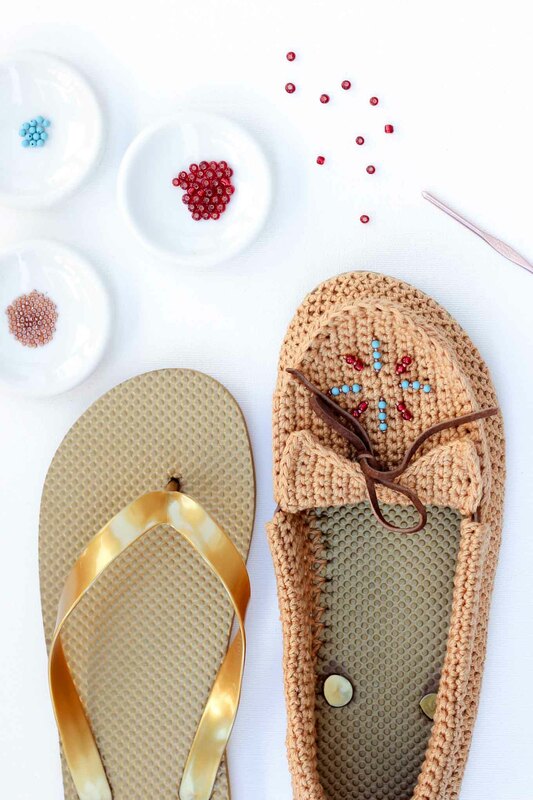 Are you ready for some flip-flop-moccasin super shoes!? 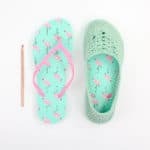 In this free pattern and video tutorial, I’ll show you how to crochet shoes with flip flop soles that are super comfortable, function as shoes and/or slippers and can be customized to adult shoe size. As always, the free pattern and video tutorial are below, or you can purchase an ad-free, printable pdf of this pattern for $2.75 here. When I was a kid, we’d go to the mountainy tourist town near where we lived and in the midst of all the candy apples, weird keychains and ubiquitous screen printed t-shirts, the only thing I desperately longed for was a pair of “real” native American moccasins. The beads. The fringe. All of it. I was obsessed. For years. But alas, moccasins in mountainy tourist towns don’t come cheap. It wasn’t until I was about 28 that I got my first pair on a trip through New Mexico. My feet have rarely been moccasin-free since. 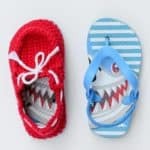 After I designed these crocheted summer slippers using flip flops for the sole, I knew a pair of crocheted flip flop moccasin hybrid super shoes was in my future. I am so psyched on how they turned out. 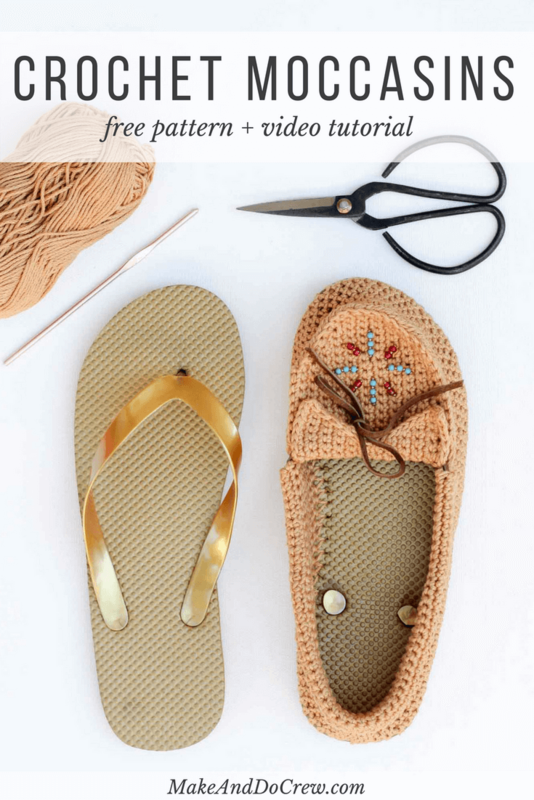 And I’m even more excited that I have a written pattern AND a detailed video tutorial to help you learn how to make your own pair of crochet shoes with flip flop soles. They’re comfortable. They’re bohemian. They’re inexpensive. They give you some serious hipster street cred. I’m just going to be honest and say that editing this video took about 150 million times longer than I thought it would. This is a pretty thorough video tutorial. 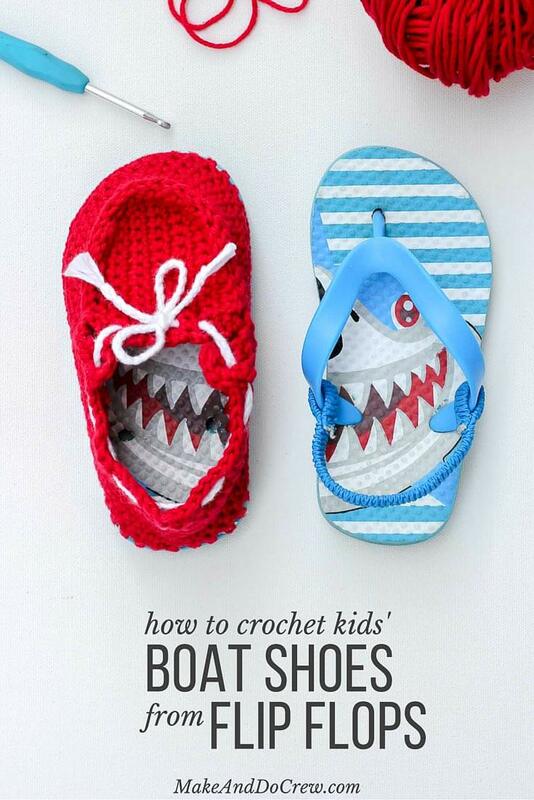 In it, I walk you through exactly how to make these crochet shoes. 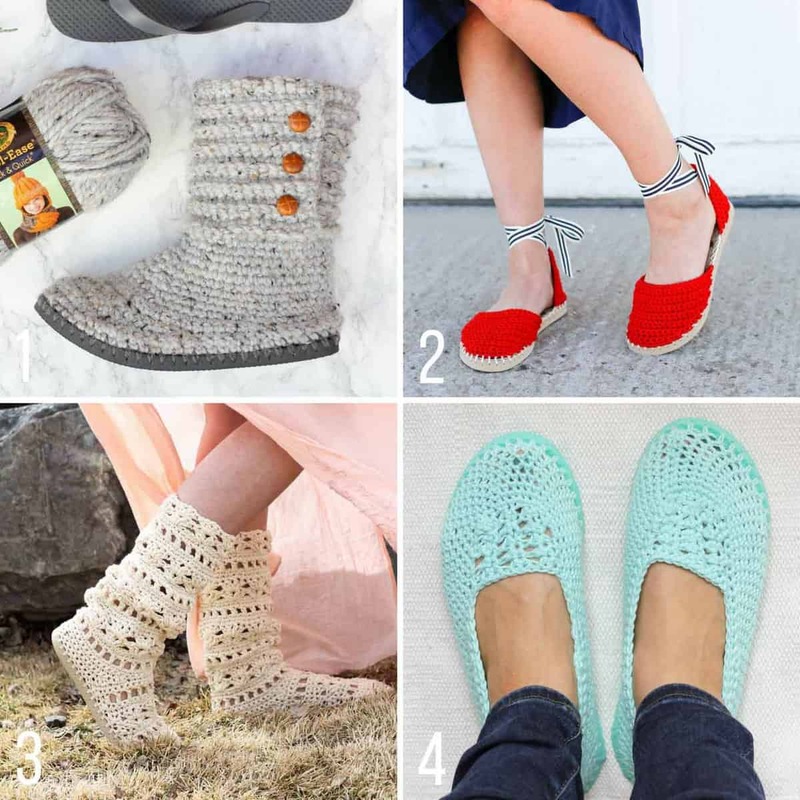 So if you’re the type of person who prefers to learn visually or doesn’t have a lot of pattern-reading experience, you should be able to watch these videos and make yourself some totally awesome crochet shoes with flip flop soles. UPDATE: Many readers have asked how these crochet moccasins with flip flop soles hold up over time. 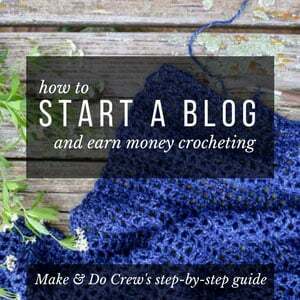 I’ve answered that question and many more in my FAQs about crocheting on flip flops. If you’re the traditional-pattern-reading type, scroll down for the full written pattern! Download the $2.75 printable, ad-free pdf. 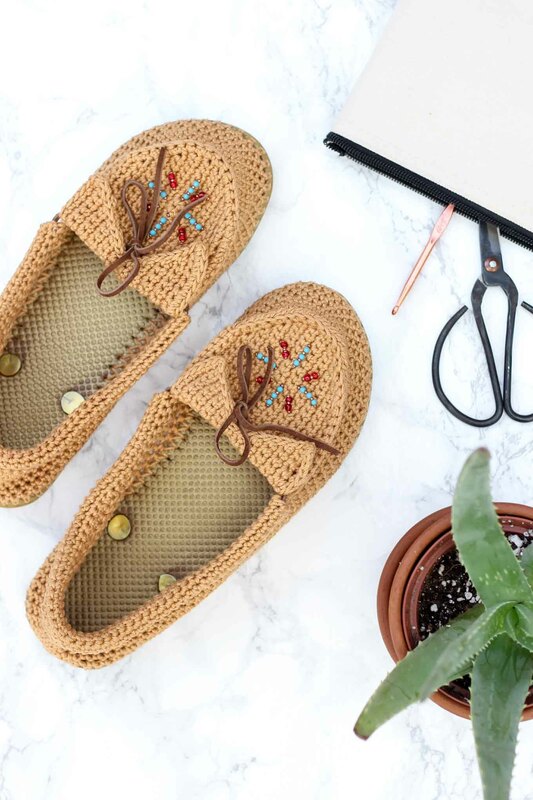 So you can spend more time making mocs and less time shopping, this post contains affiliate links at no extra cost to you. Gauge will vary a bit based on distance between poked holes on flip flop sole. You might want to size down when buying your flip flops. Since your foot won’t be held in by the flip flop strap, your normal size of flip flops might feel a bit roomy as crocheted shoes. The shoes pictured are a women’s size 8-9 and they have 89 holes poked on each sole. To make shoes with bigger or smaller flip flops, just adjust the number of holes, poking them about every .25 inches. 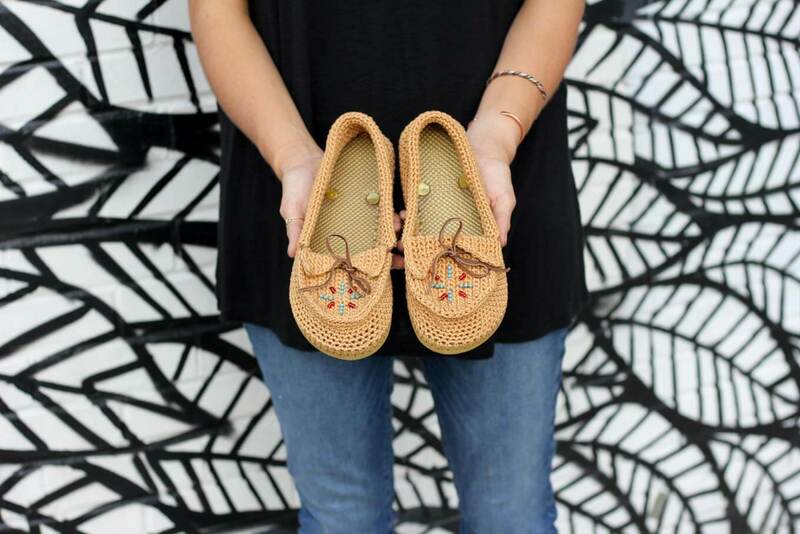 The moccasin top pattern should fit most women’s sizes. See notes in “moccasin top” section on making it wider if necessary. Find $1 flip flops on Amazonor at Walmart. Dollar Tree’s $1 flip flops tend to be a bit too flimsy, but can work if you are careful. This section is worked in a spiral. Therefore there is no need to join or ch 1 at the beginning of each round. 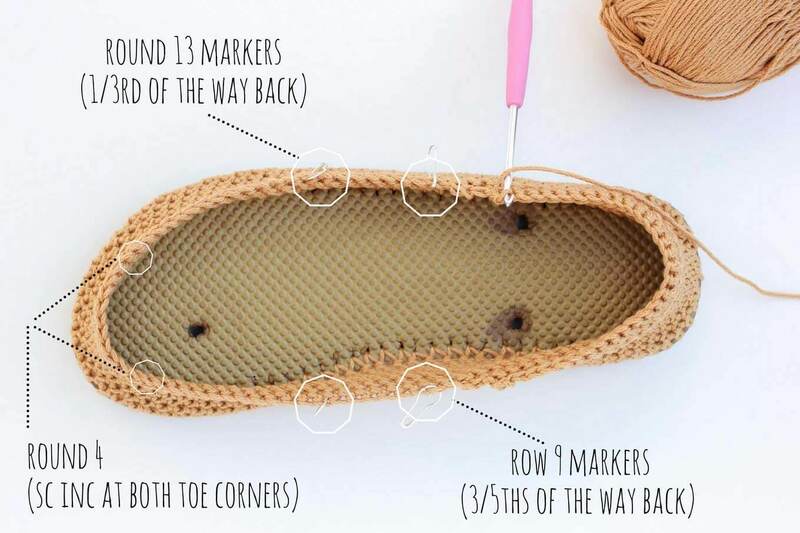 With smaller hook, attach MC yarn at the back of the heel by inserting your hook from the top of the flip flop toward the bottom of the sole, grabbing the yarn and pulling through to the top of the sole. Ch 1 through the loop you’ve created. (See Photo B.) The resulting tail inside the flip flop marks first st of this and subsequent rows. Add a proper stitch marker here if desired. Round 1: (using smaller hook) sc into each hole on the flip flop sole, sl st to join. Do not turn. Rounds 2-3: (switch to larger hook) sc in each sc around. Do not turn. Rounds 4: (See diagram below for rough placement of increases. Exact location not impt.) sc in each st until front toe area, sc 2 in one of the st near where your pinky toe will go, sc in each st, sc 2 in one of the st where your big toe will go, sc in each sc to back of heel. Do not turn. Rounds 5-8: sc in each sc around. Do not turn. Place a stitch marker on either side of the moccasin, 3/5th of the way back toward the heel. (See diagram above for placement.) The following rows are worked back and forth around back of heel. Pattern notes assume flip flop is positioned with the heel toward you and the toe away from you when the “right” or “left” stitch marker is mentioned. Row 9: (Without turning work) sc in each st until left marked st, sl st into marked st, turn. Row 10: ch 1, sk first st, sl st into next st, sc in each st until right marked st, sl st into marked st, turn. Row 11: (work toward left marker) ch 1, sk first st, sl st into next st, sc in each st until 1 sc of previous round remains, turn. Row 12: (work toward right marker) ch 1, sk first st, sl st into next st, sc in each st until 1 sc of previous round remains , turn. Remove original markers for short rows. Place markers 1/3rd of the way back from the toe on either side of the moccasin. (See diagram above for placement.) The following round is worked in the round as 1-8 were. Work sc stitches in an even density to create a smooth edge over the “bump” where the short rows taper. Round 13 is a total of approx 1.25 laps around the flip slop sole. Round 13: (work toward left marker and cont counterclockwise) ch 1, sk first st, sl st into next st, sc in each st around entire moccasin, ending at original marked st at back of heel. Do not turn. The following rows are worked back and forth. Pattern notes assume flip flop is positioned with the heel toward you and the toe away from you when the “right” or “left” stitch marker is mentioned. Rows 14, 16, 18: (work counterclockwise) ch 1, sc in each st ending in left marked st, turn. Row 15, 17, 19: ch 1, sc in each st ending in right marked st, turn. Row 20: sc in each st ending at marked st at back of heel. Fasten off yarn and weave in ends. Row 1: (using larger hook) ch 19, turn. Row 2: working into second ch from the hook, sc in each ch, turn. Rows 3, 5, 7: ch 1, sk first sc, sc in next st, sc in each st until 1 st remains, sc 2 in last st, turn. Row 4, 6, 8: ch 1, sc 2 in first st, sc in each st, turn. Row 9: ch 1, sk first st, sc in next sc, sc in each st, turn. Row 13: ch 1, sc 2 in first sc, sc in each st, turn. Rows 14, 16, 18, 20: ch 1, sk first sc, sc in next st, sc in each st until 1 st remains, sc 2 in last st, turn. Rows 15, 17, 19: ch 1, sc in each st until 2 st remain, sk 1 st, sc in last st, turn. Row 21: ch 1, sc in each st until 2 st remain, sk 1 st, sc in last st. Do not turn. Place marker in last st of this row. The follow round is worked around the entire top piece. Take care to keep stitches loose enough that the fabric doesn’t pucker. Round 22: (Without turning) work in sc around curved toe section and up the flat side of the piece. At the corner of the moccasin “point,” sc 2 in the corner and sl st down the slant of the point and back up the other slant, sc 2 in the other “point,” sc in each sc across the last flat side ending in st before marker. (See Diagram F.) Fasten off and weave in ends. Block the top piece if desired. Identify the best looking side of your top piece–specifically look at the points because one edge should be smoothest due to the slip stitching. This side should face your foot—the points will be folded over, revealing the smoothest edge. Before tying off yarn, do one stitch through the moccasin top into each folded over “point” to keep them tacked down. Fasten off yarn. 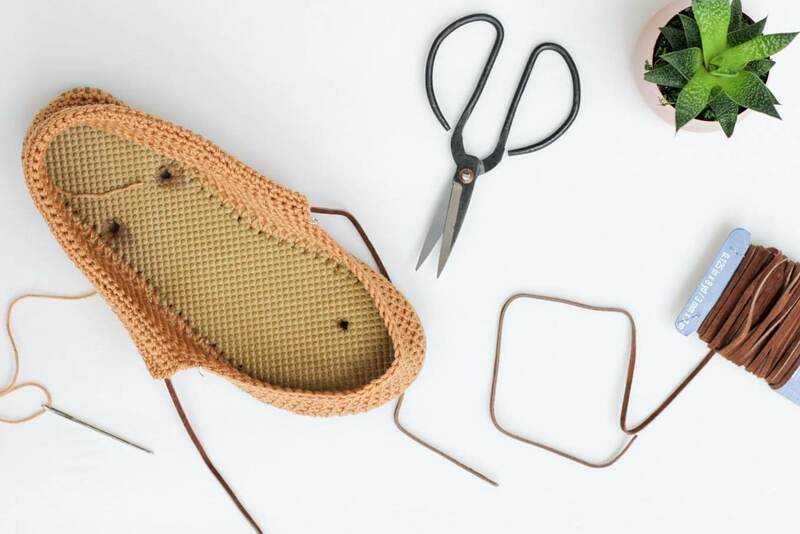 Do a little jig—you just crocheted your own shoes! High five! Ooo this pattern is fab and the video is really great. My cat sat and watched it intently with me! I am going to share it on my facebook page so my followers can watch too! I love this idea. My question is …. how well do they hold up? I don’t understand how they wouldn’t pull off the flip flop. They hold up surprisingly well! I’ve had my initial pair of slippers with flip flop soles for several months and they’re working great. I think the tension is spread between enough holes that no one hole gets all the pressure. Does that make sense? It’s so cute. Thank your guide, I will try to do a small size for my child can use in the home. I think these would make great house shoes! My daughter loves wearing her crochet flip flop slippers around our house. I just saved the pieces from the rubber straps and then trimmed off the straps so just the rubber circles were left. Then I glued them into the holes. This is my first time trying it this way and I like how it looks too! Good Idea!! I didn’t like leaving them open. I made 1 flip-flop shoe, but I was unable to get them in my size so it was just for practice. Next season I will be looking for ones that fit so I can make the mocs. Check out Amazon.com. You can get them for as little as 59 cents or more if you want a better quality. They have hundreds of different sizes, etc. What kind of glue do you use to do this portion? I used a glue called E6000. It’s essentially a multipurpose, really strong glue. You can find it at Michael’s and potentially even somewhere like Walmart. These are awesome. Thank you for sharing this with us, can’t wait to try to make them. Thanks so much, Carla! I really enjoyed making these. I hope you do too! I love your pattern for the house shoes and caint waie to try the monscons . soe for i have made six pair for christmas . i am 79 years old and have ben doing corchet about two years now to pass the time . keep sending stuf out and i will keep trying thanks .p. s. I dont sell i give away. I was having trouble seeing the words in the video for the instructions. You used white on white and sometimes blue on blue. Very hard to see but I did get the pair done. Why do you use cotton yarn and not regular yarn? I am having trouble finding the color of yarn I wont in cotton. can you help me. Yes, I understand that issue. I’m not an expert in video creation, so I learned a lot from making this one. Next time, I’ll figure out a better way to do the type on the screen. I thought it would be okay because I’m always including voice over that describes the words on the screen. I appreciate your feedback! I use cotton yarn because I tend to prefer it and it makes for a breathable shoe. That said, you don’t have to use cotton if you prefer something else. This yarn is slightly thinner than a worsted weight yarn, so if you’d like to sub yarns, just keep that thickness in mind. these moccasins are so cute. I made the flip-flop slippers from your pattern for my husbands daughter-in-law and she has told me time and time again how she loves them, so I was thrilled to see these moccasins here before Christmas. Love, love these. Thanks! Very nice!! Thanks for the pattern!! My Pleasure, Carol! Hope you enjoy it! I’m not exactly sure the width. It’ve quite thin, maybe like 1/8th of an inch. The length needed is about 2 yards (1 yard per shoe). Oh my goodness! These are an answer to my prayers. I belong to a group of ladies that knit and crochet for our local community. It includes the Budget Challenged Families with the School Backpack Program, babies, the homeless shelter/soup kitchen, providing Chemo hats for locals going through treatments and we provide a Christmas gift to be opened on Christmas morning to our local nursing homes. It is unbelievable just how many do not have gifts from loved ones to open on that special day. We have provided slippers in the past, but the issue and concern has been the residents slipping while wearing them. I know, I know they are called slippers after all, but that is supposed to be from the ability to slip them on, not slipping while they are on. This should work for our group, and we should be able to also make them for the men. Thank you so much for sharing your talent. Oh Kathryn, your comment makes me so happy! I’m thrilled to hear that this pattern will be useful to you and even happier that it will bring comfort to the people you are helping. It’s so generous of you to spend your time and creative energy making for others in this capacity. I deliberately tried to keep this pattern very affordable by using only one skein of yarn. I hope it means that you’re able to provide slippers for lots of folks this year. I have a toddler slipper pattern and another women’s slipper pattern, both with flip flop soles, so feel free to use those too if they’d help. I’d love to see a photo if your group makes any of these! Best of luck to you! I love to crochet, but I have rheumatoid arthritis and it makes my hands sore. I can only do it for short periods at a time. So the simpler the pattern the better for me. I understand how that could make crocheting hard. Does this pattern seem too daunting for your hands? What kinds of patterns have you had good luck with? I’d love to point you in the direction of some that would work for you if you’d like. I am excited about making these. I agree you have always been obsessed with moccasins. It makes perfect sense that you would figure out a way to design these. I love them. I love these – they are so cute! Unfortunately, I do not crochet. You wouldn’t happen to have a knit version would you? I would love to make a pair! I’ll def post a pattern for knit moccasins if we figure it out! 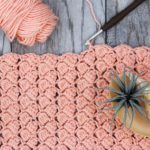 How about pulling up the first row in crochet and then using circular needles for the rest? The KnitPick needles have extremely flexible cables. Or can you not mention Knit Picks on this site because of Lion Brand sponsoring you? Yes, I think that’s a great idea. I’ve wondered about that myself. I haven’t used those Knit Picks needles, but my sister in law loves them. I’ll see if maybe I can try hers. I also think I might be able to make all the “fabric” pieces separately and then sew them onto the flip flop at the end. I’m seeing my mom this weekend who is a knitting whiz, so I’ll do a little brainstorming with her too! Thanks for your ideas! I really appreciate them! I don’t have a pattern with a white slipper and a black sole. For adults, this is the other pattern you might have seen? Otherwise, maybe it was on another site? Wow, these videos are brilliant, you are demonstrating so well and so detail-y that even the beginner like me can follow through, thanks again for these tutorials. It is awesome. Thank you so much, Edna! “Detail-y” is what I always aim to be (without dragging things out too much, of course.) I really appreciate the feedback! I love this pattern! Working on my first pair right now. 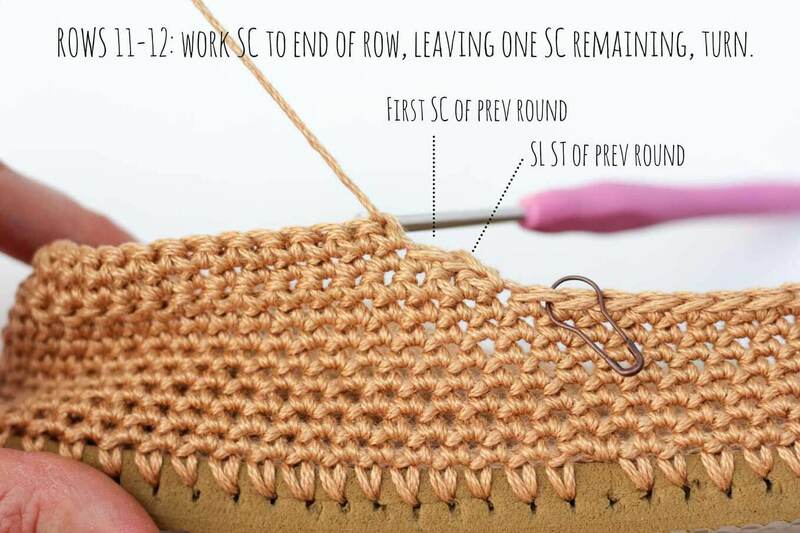 I would like to make a suggestion & a request, though..
Save yourself the headache of busting the holes on the sole by NOT trying to single crochet for the first row. Instead, try using a tapestry needle to whip stitch the yarn onto the sole… it serves the same purpose as the single crochet, in this case. I tried this after struggling to do the sc on the sole. It worked like a charm & I didn’t bust the holes on the shoe!! As for my request: the top part of the shoe is a pain. I’ve ripped my work 5 times for this part. I consider myself a pretty decent crocheter, as I’ve been crocheting for 30 years (not alot of patterns similar to this one, though). It would really help if each row of the top part of the shoe included the number of stitches worked in that row. Without that, at least for me, this part is pretty much guesswork as to where the last stitch on each row is… it gets confusing. Being able to count stitches for accuracy would help alot! Again, this is a wonderful pattern!! I can’t wait to finish my first pair & try them out! Ty! Thanks for sharing this wonderful pattern… I just know I’ll get alot of use out of it! Im glad you got it working! I love the idea of attaching the yarn with a tapestry needle. I’ve done something sort of similar and it worked pretty well. I might demonstrate that in my next video tutorial! Hope you enjoy your mocs! For the top I tried the tutorial & the pattern. I found it was easier to figure out if I did a decrease at the beginning & an increase at the end of rows 3, 5 & 7. And an increase in the beginning & decrease at the end of rows 4, 6 & 8. I then did a decrease in the beginning & increase at the end of rows 14, 16, 18 & 20. And an increase at the beginning & decrease at the end of rows 15, 17, 19 & 21. It came out in just the right shape. I also figured out how many stitches needed to be in each row… counting stitches on projects like this help me keep my work straight & save me time. I agree! I need stitch counts too! Thi would like to try this. Thank you for sharing. Your pattern. Yay! They are so fun to make (and give as gifts!) I’d love to see a pic of what you make if you’d like to share one. Thank you for sharing your pattern! I absolutely love this idea, only problem i have had with making these is that it seems they are always too big! I am doing a size 7 I dropped the size down which was fine, should I also drop down a size on the hook? This is really bothering me I need your help! I have a question, my moccasins are coming out bigger! Do I need to put less holes in the sole? Or change the gauge of my needle? Can you help me with this problem I’m having, I am using ‘I love this cotton’ because I couldn’t find lions brand Cotton. I’m making the moccasins for a size 7/8 and Im using a size small. This is the third time I’m trying this and i don’t know what I’m doing wrong here! Please help!! In my experience, “I Love This Cotton” is thicker than the Lion Brand cotton. So, most likely, you’ll want fewer holes around your flip flop. 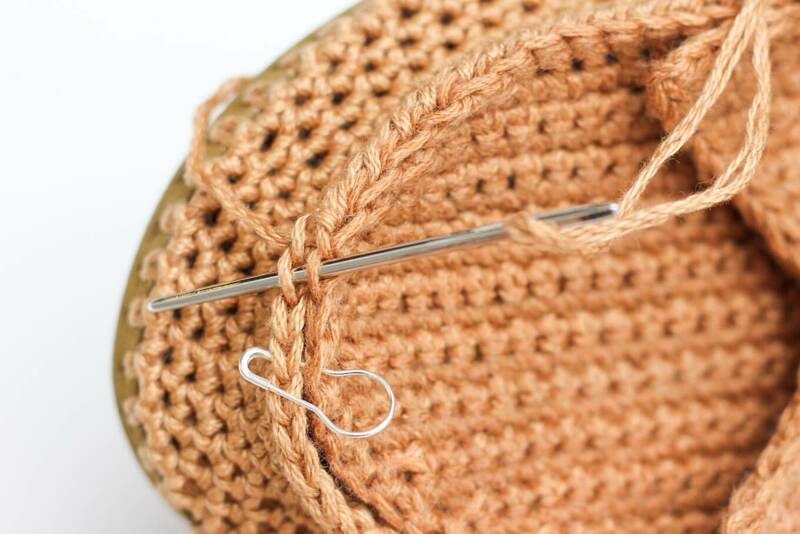 If it’s too hard to achieve that at this point because you’ve already poked the holes, you could always do some single crochet decreases over the first few rows to reduce your number of stitches. I think using a smaller hook would also be a good idea to reduce the overall gauge. For the moccasin tops then, you might want to just chain fewer stitches to begin with so that your piece doesn’t end up a lot bigger from the thicker yarn. 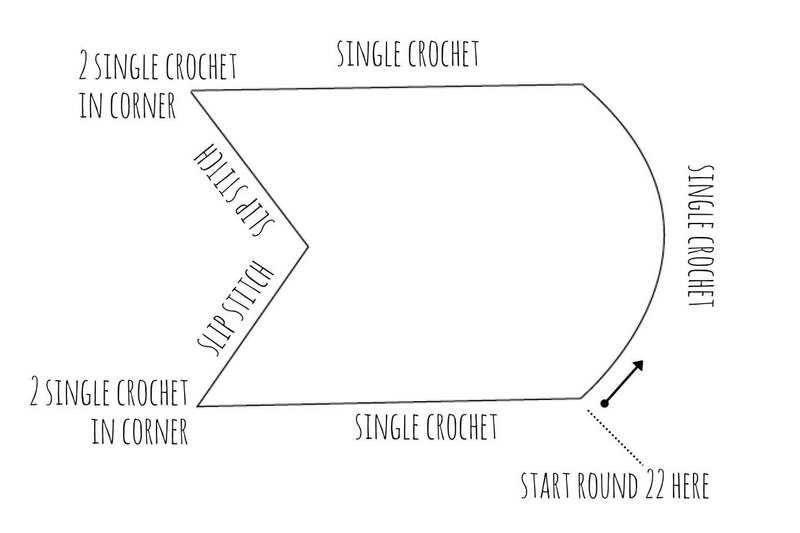 I’d also skip the two rows of just single crochet in the very middle of the top too. This will keep it from getting to wide with the thicker yarn. I hope that is all useful! Lmk if you have other questions! I am in the process of making these moccasins right now. I found when I was done making the sides of the first shoe, and I tried it on to see how it fits, it was pretty big! But the flip flop was my normal size, a woman’s 9. The conclusion I came to….. the flip flop was pretty wide. I tried my foot on the flip flop that I haven’t started crocheting on yet, and it is a wide flip flop. If I try some of my other flip flops on that I have around the house, some are narrow and some are wide. So I think if I pick a narrower one next time they will fit properly. That’s what I found for myself, not sure if it’s the same issue for you. Good luck and hope you make a pair that YOU can wear soon! I think that’s great feedback, Kim! I’ve had the best success with sizing the flip flops to my actual foot, since you don’t need all the extra rubber around your foot that you’d usually have with flip flops. Therefore, I bet that a narrow flip flop would work really well. These moccasins are awesome! Thanks for the pattern! These will make great Christmas presents. I’m going to try making them in darker colored yarn and omitting the seed beads and make each of my sons a pair! Happy Holidays everyone!!! I came across this pattern of the Summer Crochet Slippers with Flip Flop Soles that you shared on the internet and it caught my attention. At first it was confusing and then it got easier, then I decided to make the second pair, it was a little challenging for me. 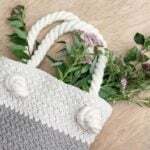 I want to say Thank You for sharing the pattern and it was fun. Thanks for taking the time to let me know! I’m so happy to hear that the pattern was useful for you! I wish the writing in the video was is in black cannot read it. I understand, Vasanti. I wanted the writing to be more of a supplement than the actual focus of the video, but a few people have made similar comments so I’ll do something different in future videos. My intention was that you could reference the free written pattern so that you could see all the written instructions super clearly. Either way, I think you’ll be happier with future video instructions! Lovely shoes! I definitely want to try them out. 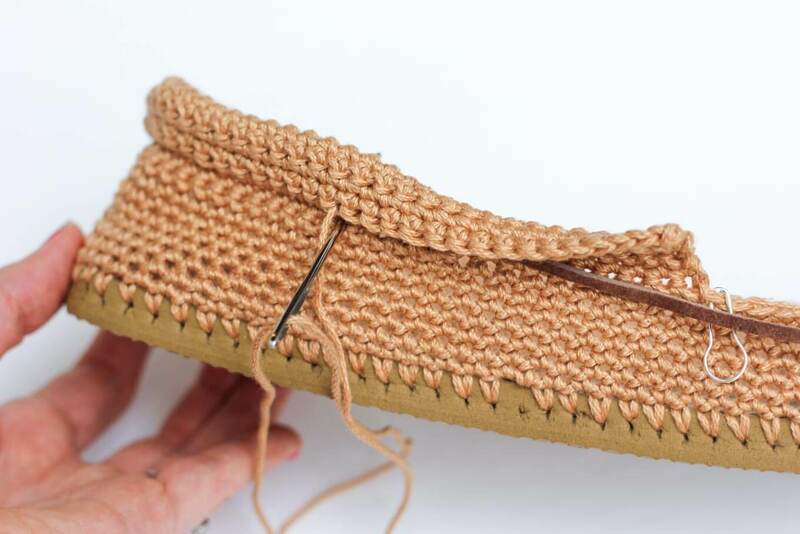 The photos above the words “Begin Rows for Leather Laces “Tube”” and “Moccasin Top” show a hole in the flip flop with no stitch. Did that one pull through, or did you miss it? I think I might be able to do this! Thanks for posting! So cute! I want a pair of those moccasins! Im a knitter, but I think I might broaden my horizons for this! Love this pattern. On my first one, the moccasin top, I watched video and followed written instructions, however it is super wide. When I look at your video your piece doesn’t look like it’s 20 rows. Do you know how many you did? Should I just adjust as I think makes sense? I am making the moccasin top and it’s way too wide. The one in your video doesn’t look 20 rows. Do you know how many you did? And if I eliminate some rows, which rows? I’d eliminate the middle few rows if it’s turning out too wide. The idea is that you want it to be symmetrical, so if you eliminate the last increase row, for example, you’d also want to eliminate the first decrease row. My son has been looking for a pair of ‘driving shoes’. I think these might work. Any comments on how these shoes work for men? Driving shoes sound nice! Is your son nearby in a way you could try them on him as you work? I think they’d work great for men. You may decide to add a couple extra rounds around the entire sole to make it a bit higher if he has large feet. Similarly, if his feet are big, I might add a few stitches to the initial chain for the top of the foot section. Overall, I think if you just customize them a bit to his foot length and width, you should be in great shape! Your boots I’m thinking of putting sheepskin insoles in the base and faux fur in the inside leg part folding a little over the top for extra warmth in winter. Hello from Colorado, USA, Lucy! I’m so happy to hear that you think these shoes could add some functionality and style to your wardrobe! I LOVE your idea for the faux fur. That sounds so cozy! I’m always adding more flip flop patterns, so if you’re ever interested in seeing them all at once, you can do so here. Very nice pattern,I’ll want these istruccion in spanish,thank you. I made 4 pair of your moccasins for Christmas gifts this year. It was my brother’s family and they were for the 4 women in their family. I would have and still would like to make a pair for my brother. I know he would probably wear them as that is the type of shoe he wears especially around the house. Can I use this pattern to make them for him or would I need to do something different for him? Hermoso modelo. Làstima que el video no tenga la opciòn de leer en español, lo que dificulta seguirlo cuando no se habla inglès. Saludos desde Argentina.